Hazelnut Liqueur Affogato - Vanilla Gelato, Hazelnut Liqueur & Espresso! 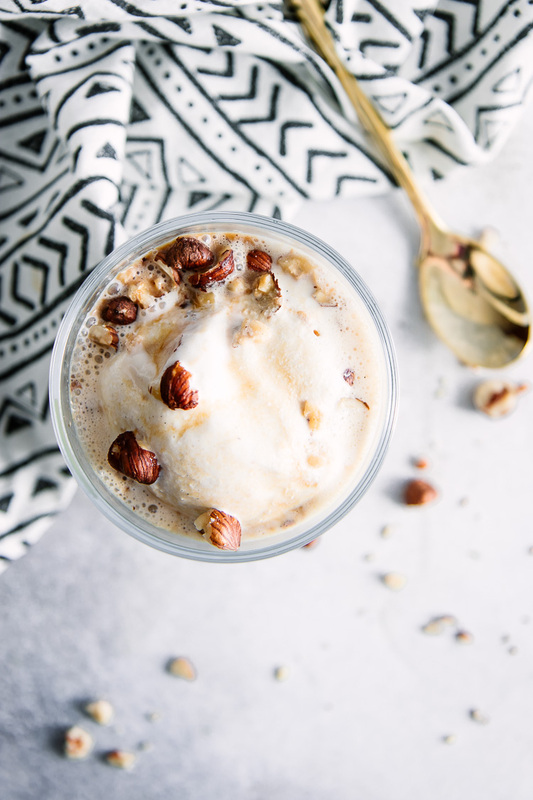 Hazelnut Liqueur Affogato, the perfect afternoon dessert treat. Vanilla bean gelato with hazelnut liqueur and espresso – a delicious summer pick-me-up! I liked espresso, hazelnut liqueur and gelato well enough (ok, a lot) by themselves, but had no idea combining gelato and espresso was a thing until I married into the Italian culture. I vividly remember a sunny day in Rome when we stopped for our daily afternoon espresso and gelato (yes, daily) and the Italian Husband combined the two. The affogato is an Italian classic, the perfect afternoon pick-me-up treat of sweet vanilla gelato and a shot of espresso. However, what’s another afternoon pick-me-up that we all know and love? Liqueur. And what liqueur would taste amazing with both vanilla bean and coffee? It had to be hazelnut. And what do you know, I happened to have a bottle of hazelnut liqueur looking lonely in the cabinet. A fancy serving bowl or glass. I’ll let you in on a little secret: put anything in a crystal dish and it automatically looks fancier than the old chipped bowl you’ve been using for years. I bought the small dish/glasses used in these photos at Goodwill for $1/each, but these small glass dessert dishes are a great Amazon find. A good bottle of hazelnut liqueur. Don’t skimp where it counts, get yourself the best hazelnut liqueur: Frangelico. No explanation needed. Good espresso. This is not your grandma’s drip coffee (I won’t name names). Get some nice espresso. The Italian husband’s favorite brands are Illy and Lavazza. Don’t have an espresso machine? See below for the real Italian way to make espresso at home. Really tasty vanilla gelato. While you can go with any old vanilla ice cream, I suggest making sure it’s actually gelato to get the creamy smooth flavor of an authentic affogato. Don’t have an espresso machine? No worries! I’ll let you in on a little secret: most Italians do not own espresso machines, though they drink it every day. Their secret? The mokka! This small coffee machine can be found in most every Italian household and is the go-to for a caffeine pick-me-up. Loving the affogato dessert idea but want to expand your flavor profile to make it your own? Check out this great post by The Spruce on an A – Z list of liqueurs and see below for flavor ideas that will take the gelato + espresso + liqueur combination next level. The possibilities really are endless! Let me know your affogato ideas in the comments and I’d love to hear how you make this simple dessert your own. Craving more light and fresh superfood desserts? Check out our Saffron Poached Pears and the light Blood Orange, Kiwi & Mint Fruit Salad recipes, both are lightly sweetened fruit-based treats. Have your sweet, and have your superfoods too! Did you make this simple Hazelnut Liqueur Affogato? Leave a comment below and rate the recipe to let us know how it turned out. Save this affogato recipe for later by pinning to your favorite summer recipe Pinterest board and make sure to tag me on Fork in the Road’s Instagram to show me your dessert creations! Hazelnut liqueur affogato with vanilla bean ice cream. A perfect afternoon sweet treat, happy hour shot and caffeine pick-me-up all in one! Brew shot of espresso in espresso maker or mokka. Once brewed, mix espresso shot with one shot hazelnut liqueur. 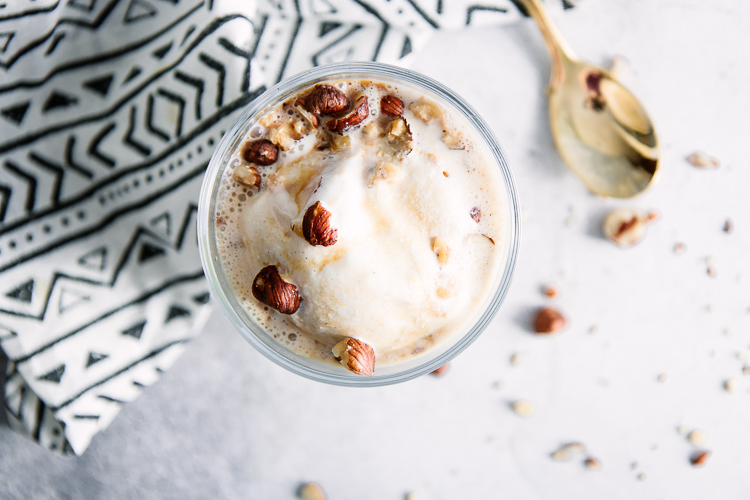 Pour espresso/liqueur mixture over one scoop of ice cream, top with crushed hazelnuts and enjoy immediately. Notes // Tips: See post above for liqueur variation ideas, such as swapping hazelnut for Chambord or Sambuca. 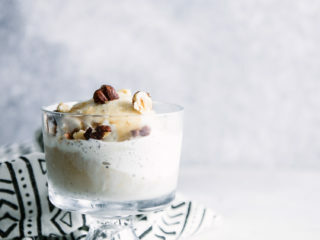 Leftovers & Storage: Because the point of an affogato is to pour hot espresso over cold ice cream, this Hazelnut Liqueur Affogato recipe is best when made immediately before serving. However, it only takes five minutes to prepare so it is a great choice when pressed for time. 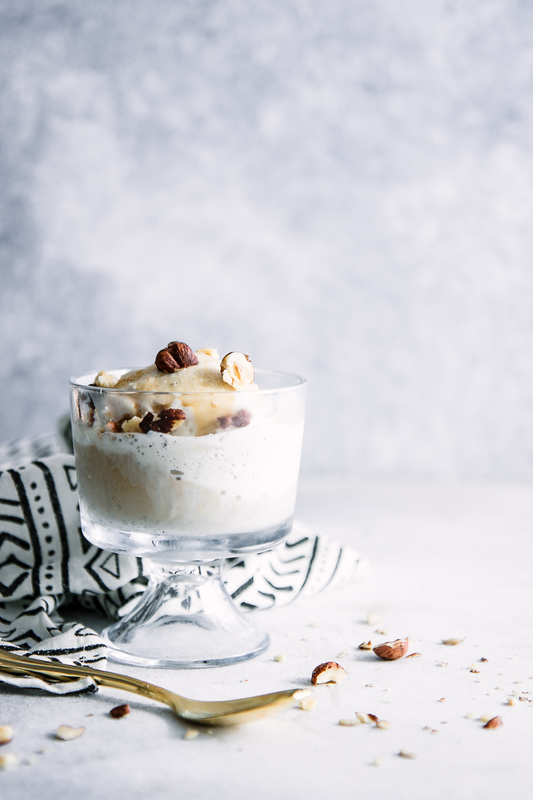 Nutrition: This affogato recipe contains full fat dairy gelato, which means a fair amount of saturated fat and sugar. However, with all things in life, balance and moderation is key and you should enjoy it as a part of your overall balanced diet. Make it vegan: Use coconut or another plant-based ice cream for a vegan treat. I’m really regretting the fact that I don’t have anything in my kitchen to make this recipe, because it looks SO good! I need to stock up on these ingredients and make it soon. What a great summer treat. It’s seriously the easiest dessert recipe. I am notoriously bad at baking, so a three ingredient dessert is right up my alley! I haven’t had an affogato in years, must have been 20 years ago in Rome. This brought back memories and it was very easy to make. The only hard part was waiting for the espresso to cool down (I put it in the freezer). The first affogato I had was in Rome as well and I knew that I had to come home and make my own. Enjoy!